While divorce rates across all populations are on the decline, divorces among couples over age 50 have continued to rise. Below, learn about the reasons why more older Americans are considering divorce at more advanced ages, and find out what you need to know if you’re considering divorce in your later years. Why are more couples divorcing at older ages? While young, many baby boomers were instilled with the idea that couples must never divorce, no matter how unpleasant their spouse or how unhappy the marriage. As societal taboos against divorce have faded, however, more and more older adults are realizing that they can choose to live a more fulfilling, enjoyable life by ending a marriage that isn’t working. Additionally, people are living longer than ever, and staying healthy and active well into their senior years. With so many good years left to live, seniors aren’t willing to consign themselves to one to two more decades of their lives with a spouse who doesn’t make them happy or share their interests. Finally, many couples coexist peacefully while their children are still at home or they both work demanding full-time jobs. Once children head off to college, or one or both spouses enters retirement, however, couples may realize the extent to which they’ve grown apart, or simply never connected on as deep a level as they desired. Keep your future front of mind: Divorce can be a very expensive process if it is not handled properly. 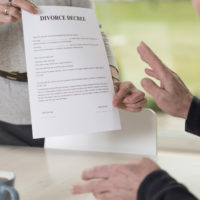 When you’re nearing retirement age, it is especially important not to waste funds on a contentious or drawn-out divorce. If possible, consider mediation with your ex, to ensure that you don’t waste a hard-saved nest egg on splitting. If you’re an alimony recipient, ask your attorney about taking out a life insurance policy on your former spouse. That way, should anything happen to your ex, you will continue to have an income stream for a time after alimony ends. Make smart choices about the property you request in the divorce: if you’ve long lived in the home you shared with your spouse, you may be tempted to keep it. However, maintaining a house may be a drain on your reduced and, possibly, fixed, income, whereas choosing to receive a portion of a retirement or investment account instead could provide more value. If you’re considering a gray divorce in New Jersey, contact the knowledgeable and seasoned Union divorce and family law attorney John B. D’Alessandro for a consultation, at 908-964-0102.